Let’s be straightforward with this review and tell you that it deserves three stars, no matter how many unkind writeups about the movie you have read before this. And we are even going to be so organized and analytical that we will tell you which areas each of these three stars go to. Now, that would be something the people of the future will be proud of. How apt this is, because the story is set 400 years in the future, and it sure isn’t a happy place. No one smiles because a disease has wiped out almost everyone on Earth. The rest of the people live in this walled up area, and there are people who are unhappy with the state. So, enter Aeon Flux the assassin, who goes on a mission to kill some big shot in the government. Along the way, she discovers some conspiracy that will has affected humankind. Or something like that. Who cares about the storyline, when the visuals are so stunningly futuristic? Yes, that is where we are awarding the first star to. Shot in location in Berlin, Germany, the 92-minute movie provides us with a glimpse of what a terribly cold world we might be living in 400 years down the road. The chilly feel of the architecture is nicely complemented with the beautiful wardrobe worn by the cast. And that’s where the second star goes to. Charlize Theron, who plays the titular assassin, must be one happy girl during the shoot, because of the gorgeously ultramodern clothes she gets to wear. The movie is like one lavish fashion show, complete with a cool synthesizer soundtrack packaged with Theron’s beautiful sashays across the screen. And where does the third star go to? Well, some may not see this as a compliment, but the third and final star awarded to this movie is how it manages to make established movie stars look ridiculously silly. First, we have Theron (Oscar winner for her performance in 2004’s Monster), who slinks and crawls around in her skintight outfit. Next, we have Frances McDormand (Oscar winner for her supporting role in 1996’s Fargo) who sports a absurdly orange hairdo while spouting self-important dialogue which makes no sense whatsoever. Third, we have Sophie Okonedo (nominee for Best Supporting Actress for her role as Tatiana Rusesabagina in 2004’s Hotel Rwanda), who has hands for feet. Yes, she walks with her hands. Enough said. This sheer amusement prompted us to review this movie with lightheartedness, and award it with a passing mark of three stars. The world is already such a grim place, and there was no slight indication of any happy character in the movie. So, why would we make our lives more miserable by picking out all the wrong things about it? Besides, you have probably read them about from many other sources. Yes, this movie left us suitably amused, but we sure hope that the world would not look like that in 400 years time. Surprisingly, there is quite a fair bit of extra features on this Code 3 DVD. Now, if only the movie had been better, it would make this disc a must-have for a serious DVD collector. Commentary by Charlize Theron and producer Gail Hurd – Kudos to the DVD producers who managed to get Theron to give a full-length commentary about the movie. She talks about her experiences acting in front of green screens, while Hurd talks about the locations they shot at. Not terribly exciting, but still worth a listen. Commentary by co-screenwriters Phil Hay and Matt Manfredi – These two men talk about their struggles trying to adapt this MTV series to screen, and are often amusing with each other. Interesting to hear how these two screenwriters conceptualized and adapted the series for the big screen. Creating a World: Aeon Flux – In this 20-minute feature, you will hear producers, screenwriters, the series creator and graphic artists talk about how the movie was visualized on the screen. Actual footages of the MTV Aeon Flux series are also included in this feature, and you’d realize Ms Flux isn’t as babelicious as Ms Theron. 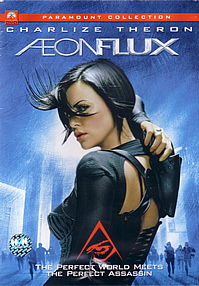 The locations of Aeon Flux – The 14-minute feature includes interviews with the movie’s director, producers and technicians about how they chose Berlin, Germany for the movie’s main location shoots. The team had wanted to choose Brasilia, but due to logistic problems, they ended up in Berlin, and uncovered some stunning architecture dating back to before the World War II era. The stunts of Aeon Flux – Theron demonstrates her ability to twist and turn in the most agile and beautiful manner in this 9-minute feature. For the role, the former dancer went through some serious gymnastics training, and some of the shots featuring her doing her training do look terribly painful to us. The costume design workshop of Aeon Flux – The costume designers of the movie tell us how the striking and dazzling wardrobe were conceptualized in this 13-minute feature. For a futuristic film like this, it is very interesting to see what kind of materials these people were inspired by. The craft of the set photographer on Aeon Flux – In this brief 3-minute feature, the still photographer talks about some really technical stuff about his camera equipment, and certain choices and decisions he made for the pictures taken on the set. Trailers – Other than a trailer for the movie, Paramount’s summer blockbuster for 2006 Mission Impossible: 3 is also included on the disc. The visual transfer for this DVD is clear and stunning, and makes the already beautiful images even more beautiful. Audio options include English and Thai 5.2 Dolby.